After all danger of frost has passed and night temperatures are 60F or more. 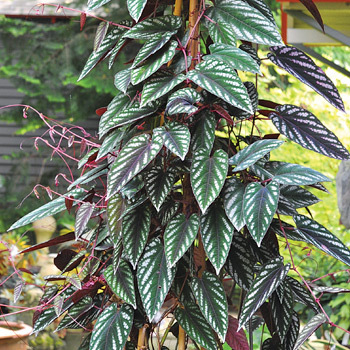 Rex begonia vine has silver-streaked foliage flushed burgundy on the reverse-captivating in pots, the plants either trained on an obelisk or allowed to trail. A coveted patio plant that can be taken indoors to overwinter in a warm room. Watering Details: Keep evenly moist; at least 1" of water per week. Containers may require more, particularly during hot or dry spells. Plant: Ambitiously growing vines with elongated heart-shaped leaves of green, pinkish-wine red, and silver variegation, with red backs. Will climb with tendrils or ramble as a ground cover. Seeds: Plant generally does not set seeds. The Rex Begonia Vine is actually not a begonia, not even classified in the same family, but is instead a member of the grape family, Vitidaceae.